Dance Commentary by Heather Desaulniers: "With Ballet in My Soul"
Dance memoirs come in an array of packages and from a host of different perspectives – dancers, choreographers, company directors, even fans and enthusiasts. Eva Maze’s With Ballet in My Soul – Adventures of a Globetrotting Impresario, published by Moonstone Press, adds another viewpoint to this oeuvre, that of presenter, producer or as the sub-title of the book denotes, ‘impresario’. 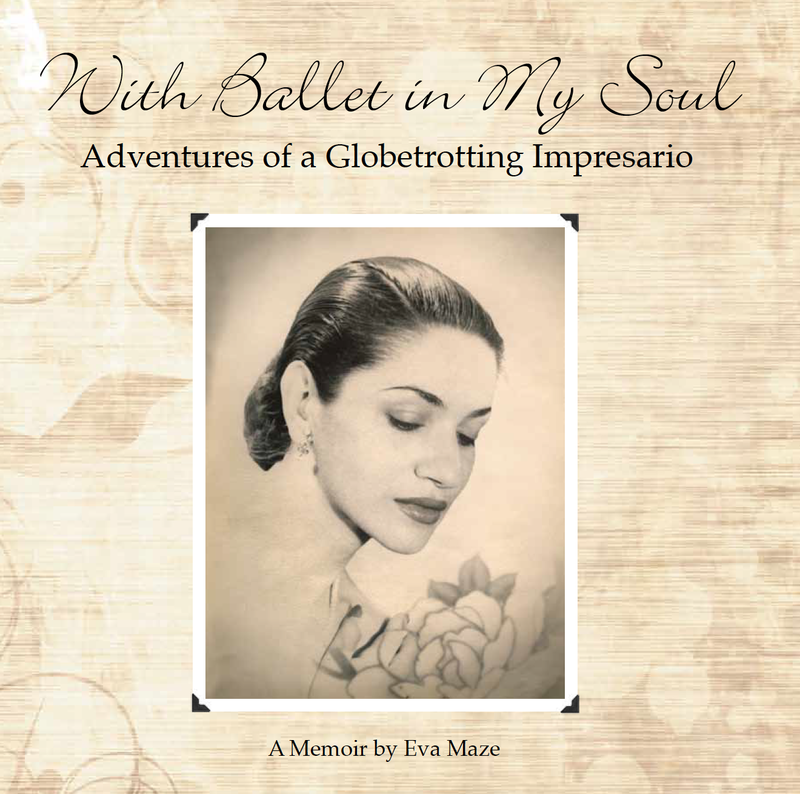 Part history, part personal journal, part memory scrapbook (it contains a stunning collection of photos and memorabilia images), With Ballet in My Soul chronicles Maze’s lifelong relationship with dance and the performing arts. A delightful and charming literary sojourn, the book also relays a potent message. It is certainly an inspiring narrative about artistic passion and unrelenting commitment, but in addition, makes a strong statement about female empowerment. As a young woman, Maze sought after a career that had been predominantly male. And she did so in a time very different than today. Maze begins her story by taking the reader to her early years in Romania and shares how from a very young age, she adored ballet. Sadly, a battle with a childhood disease kept her from pursuing a career as a professional dancer. But this isn’t a tale of broken or crushed aspirations, instead, Maze introduces the reader to a multi-layered dream. Not one single pathway, but more like a tree, with many different branches that she would traverse over her lifetime. She details her family’s move to the States, her marriage, and how as a young adult, she returned to the studio, and began an intense study of ballet. Her husband’s profession required a number of international relocations, and in each of these new homes (London, New Delhi, Frankfurt, Tokyo, Berlin), Maze continued her artistic pursuits as well as immersing herself in new dance forms and techniques. In New Delhi, a number of noteworthy personal and professional developments unfolded. There, she tackled dance analysis and criticism on the radio, and as a result of a very ordinary, everyday conversation, started her work as an arts presenter. Frankfurt was the family’s (Maze and her husband now had two children) next stop, where Maze tried her hand at television and experienced the ups and downs of further presenting. She also formally established her own production company, branching out to include work across a range of performing disciplines, all during the time of the Berlin Wall. The second half of With Ballet in My Soul outlines a series of life-changing events and professional milestones, many of which occurred amidst some shocking history. First is Maze’s overseeing and production of the “International Folklore Festival” to coincide with the 1972 Munich Summer Olympics. While the festival was an artistic success to be sure, those games saw unfathomable terror and tragedy with a deadly hostage taking and standoff. In stark contrast, Maze spends the next section of With Ballet in My Soul inviting the audience into her private, family life as the Mazes recuperate, rest and relax during vacations, and subsequently find a ‘home away from home’ in Corfu, Greece. They would spend many peaceful summers there, though that tranquility too would see political upheaval as they witnessed a military coup and dictatorship from the late 1960s and into the 70s. Back to Germany and continued expansion of Maze’s producing activities over the next two decades. She facilitated numerous dance, theater and music engagements, including The Finnish National Ballet, Ballet Rambert, The José Limón Dance Company, Lar Lubovitch Dance Company and American Ballet Theatre, just to name a few. And the final two chapters of the book follow a time of transition and retirement, first in Paris and currently, in Sarasota, Florida as Maze moved into the role of artistic civilian. A lovely read, With Ballet in My Soul tells the story of a creative spirit who has always and continues today to seek after the culture, beauty and innovation that is cultivated and celebrated in the performing arts community.